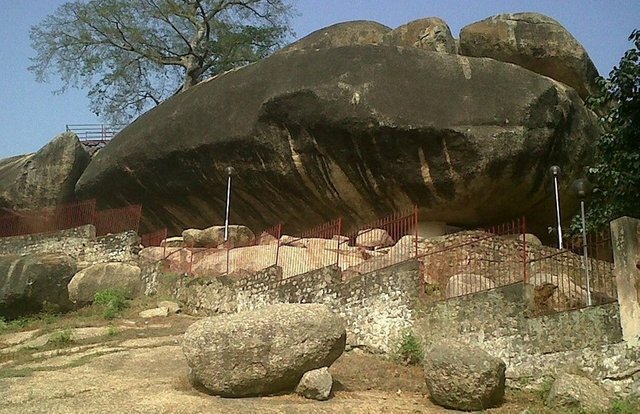 Olumo Rock is a popular tourist attraction in the city of Abeokuta , Ogun State , Nigeria. Abeokuta lies South West of the Republic of Nigeria and is 100 kilometres from Lagos . To the North some 70 kilometres away is the city of Ibadan the capital of Oyo State. The climate is hot and humid with an annual rainfall of 47 inches. Olumo rock, one of the most popular tourist destinations in Nigeria, West Africa, sits in the ancient city centre of Abeokuta. – a name which means “Under the rock”; Olumo Rock is an irregular formation of igneous rock with a massive outcrop of granite rock composition. 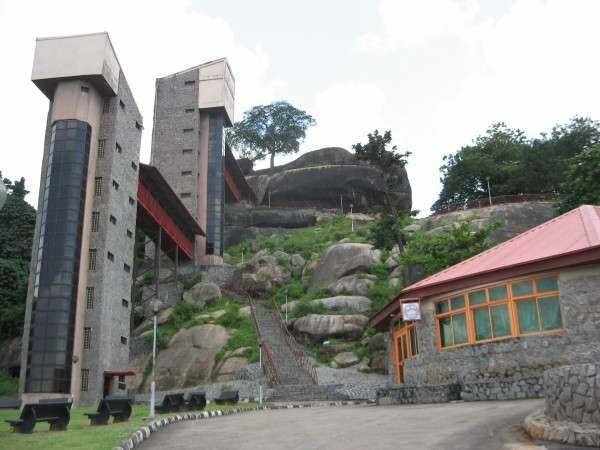 The rock is an historical monument which served as shelter and fortress for the Egba (A tribe in the western part of Nigeria) people who at 1830 had settled under the rock during the intercity wars. The rock is a monument of Faith, Unity source of strength and unfailing protection for Ebga people(A tribe in the western part of Nigeria). In search for refuge, Olumo Rock was discovered by a hunter named Adagba and he found the rock to be a natural place of refuge from wars and threat of wars.Olumo Rock is said to be 137 meters above sea level and is half the height of the Eiffel Tower in Paris (300 meters) provided an aerial view of the surrounding communities and with this picturesque, warriors could prepare a better attack against their opponent. people developed man-made stairs carved into the rock, making the climb fairly easy even for less fit visitors to this tourist location. There is also the availability of an elevator which was installed for those who don’t want to do any climbing. From the top of the rock, you can view almost the entirety of Ogun State; landmarks such as the Ogun river, the first TV mast and old secondary schools and family buildings where popular Nigerians grew up could be seen from the top. It is indeed an awesome sight and a wonderful work of nature’s art. Olumo Rock is one of the largest African heritages. Conserving our natural and historic heritage for all to enjoy now and in the future, and also recognizing and protecting the landscape values of the rock area for the purpose of creating pleasing physical environment for living, working circulation and recreation. Are there any festivals or special events that are held here throughout the year? Yes Festivals are held yearly. Thanks for your response. It seems like an interesting place. You should connect it to the Steemit world map.